Named after the renowned Monticello Motor Club, this lineup of sporty watches was built for speed and acceleration. lifestyle of the big apple. SO & CO was born in New York, inspired by the City's dynamic effervescent lifestyle. Our constant emphasis on producing fashion-forward designs, drives our commitment to bridging the gap between high-end fashion and affordability. Named after the renowned Monticello Motor Club, this lineup of sporty watches was built for speed and acceleration. For the drive to simply go without being held back. 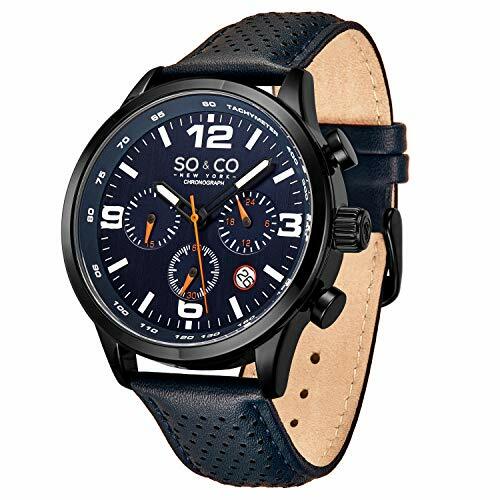 Sleek, yet daring, the collection offers a bold array of watches equipped with advanced tachymeter displays and sharp chronograph displays, a deserving homage to the ever moving up-tempo lifestyle of the big apple. 4 60 DAY MONEY BACK GUARANTEE; we believe in our product, simple as that. If you have any questions about this product by SO & CO, contact us by completing and submitting the form below. If you are looking for a specif part number, please include it with your message.